Situated in a sheltered valley and surrounded by old oak trees, the 250 year old farmhouse offers relaxing al fresco dining – or if the weather is unpleasant, indoors in the historic old farm building. The Cape Farmhouse Restaurant is a family run concern on route to the Cape Point Nature Reserve. 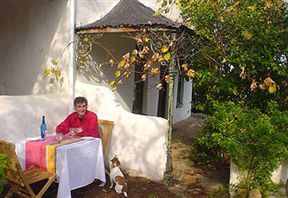 The Farmhouse serves delicious breakfasts, and the lunch menu redolent of the tastes, spices and herbs of Morocco through to the Cape itself. Breakfasts are farm-style, with home-made bread and real free-range eggs. 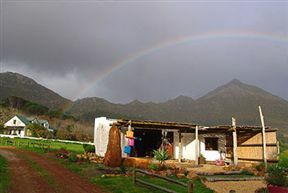 As much of the produce as possible is gathered from their own organic vegetable gardens. Teas and coffees are served all day, along with mouth-watering farm baked cakes. Rock at the Saturday Farmhouse Rocks outdoor concerts! 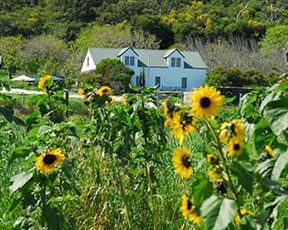 The Cape Farmhouse hosts Saturday concerts showcasing South African musicians. These are outdoor events with food from the fire and a cash bar. So, slap on some sunscreen, throw a blanket on the grass, grab a frosty and groove to your favourite band! Open seven days a week 09:30 – 17:00. There is plenty of safe space for kids to play. at the bottom of Red Hill - Junction M66 & M65. Sitting in the sun on the pretty terrace eating one of their tasty omelets starts the weekend right. Still one of the best kept secrets in the South Peninsula. This family friendly restaurant and music venue has it all. Inspired food and cakes, beautiful safe and child friendly settings and venue for some of the finest live music in South Africa. Cape Farmhouse is 31km from the centre of Cape Town , the nearest airport 33.7km (Cape Town International Airport).